Eating away from home with baby can be a breeze or a nightmare. Anyone who has dealt with a fussy little one in a group of people knows those disapproving looks. If your child has a comfy seat, things are much more likely to go smoothly for everyone! Whether you’re looking for a booster, a foldable high chair, a chair harness, or something in-between, there’s something for you. We’re going to take a look at the best portable high chairs on the market to help you find the right one for you. A portable high chair can serve several different purposes. If you’ve ever tried to feed a baby and feed yourself at the same time, you know the value of a portable high chair. It can also be used for entertainment. There are times when we need a moment to answer a phone call, get dressed, or take care of something around the house. Being able to put the baby in a booster or portable high chair in front of the TV or with some toys can be an absolute lifesaver. 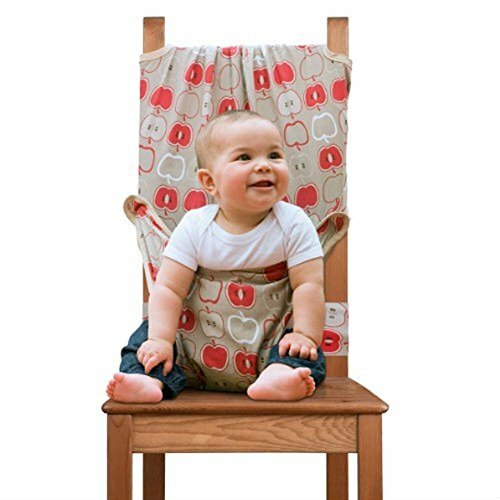 Portable high chair: This option is for families who want to have something very similar to a full-size high chair that also can be folded up easily for transport. They will usually have some of the standard features a normal high chair would have without the bulk. Combo high chair and booster seat: A combo set-up is a high chair with a removable seat that functions as a booster. A combination high chair and booster would be a great idea for people who prefer one item that does double duty as opposed to two separate units. This would be especially handy for those families with space constraints. Hook on high chair: A hook on high chair actually hooks onto a table with the baby seated right at table height. While the most common use for this seat is for travel, it can also be used at home. It’s a much smaller option, so it would be a good choice for those with space issues. Not worrying about attaching to a chair is another advantage of these style seats. Portable booster seat: These seats are made of a smooth plastic. 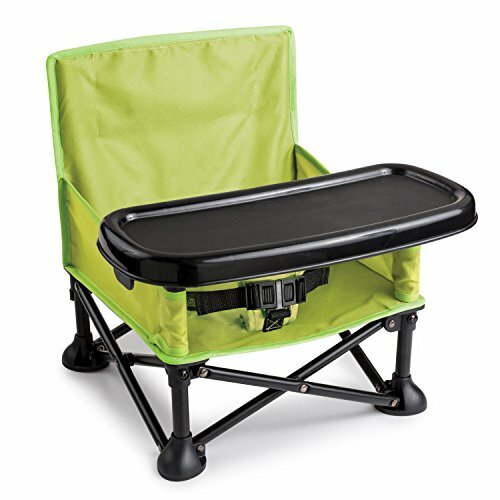 A portable booster seat can be conveniently folded up and easily taken right along with you. They have straps that attach the seat to a regular-sized chair or they can be used on the ground or another flat surface. Chair harness: This option is a little bit different than the others but would still make a great choice, especially since it’s the smallest option! Chair harnesses are made of fabric and attach to a chair, securely holding the baby in place. As they are almost completely fabric they can be folded into a very compact little bundle. Foldable booster: Though they sound alike, these types of seats are different than the other boosters on our list. As opposed to being made of plastic, they are made of a durable canvas-type material and fold up in the same way that camp chairs do. They would make a good, compact option for camping or the beach, especially, but can really be handy anywhere. Is it durable and well-made? How easy is it to travel with? Does it include carrying straps or a case? Where will it be used the most? Is it versatile enough to suit our needs? Does it have the right safety features? We have found some great options for you to check out! The Ciao! high chair would be a great choice for a trip to grandma’s or picnic in the park. It is made of a heavy-duty material that easily wipes clean. It conveniently folds up and slips into its own carrying bag, making it easy to take anywhere. It comes in nine different colors to suit the taste of any mom or dad. The high chair doesn’t require an assembly, which is an added bonus, especially when you’re trying to wrangle a little one at the same time. Check out a video of the Ciao! Baby portable high chair here. Weight recommendations: minimum-10 lbs., maximum-50 lbs. This portable high chair and booster seat combo is perfect for all the stages of your child’s early development. It starts as an infant high chair, with a reclining back, as a traditional baby high chair, or remove the seat for an infant booster. Later, you can use it as a toddler high chair or a toddler booster, whichever suits your needs. You can also seat two children at once. The bottom leg section can be removed and used with the tray for a toddler table and chair combo as well. There are five height adjustments, so you can fit this high chair to any table. It is easy to clean, even if your baby is a messy eater. 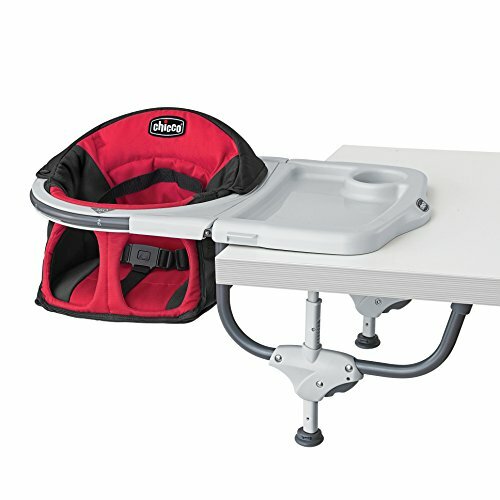 The large tray holds meals, toys, or anything else your baby needs. Best of all, it is foldable for easy storage or traveling, whether taking just the infant or booster seat or packing up the whole works. Weight recommendations: Infant recliner/booster – maximum 40 lbs., Toddler booster/youth seat – maximum 60 lbs. The super lightweight Chicco 360 Hook-on would be a great choice for feeding baby on the go. It folds flat, making it easy to take anywhere. The chair is made from nylon that wipes clean. It attaches easily to a table and the grips are rubberized so you don’t need to worry about leaving unsightly marks on tables. It also keeps the baby’s fingers from getting pinched! 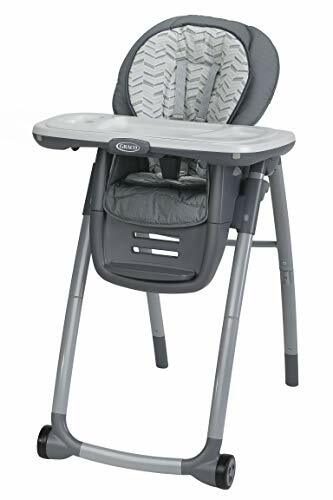 The attached harness keeps your little one from sliding out of the seat, and because it attaches to a table, much less food ends up on the floor. Weight recommendations: minimum-16 ounces, maximum-37 lbs. This Fisher-Price booster has features that would make it a wise all-around choice for a portable seat. It is made of durable plastic and doesn’t have any crevices, making it very easy to clean. In addition, the tray, which has a snap-on lid, can go in the dishwasher. This makes it easier to keep clean and sanitized for little ones. It can be adjusted to three different heights, so it’s compatible with a variety of tables, anywhere you go. It folds nicely for travel, with a convenient carrying strap. The Totseat Chair Harness is a different kind of portable high chair. It is made completely of fabric and can fit any chair and just about any child. It wraps around the baby and holds them securely in a regular adult chair. The sturdy, but comfortable fabric is machine washable and will hold up to frequent washings. It folds up into a very small pouch that’s just a little bit bigger than the size of a cell phone, making it easy to stick in a diaper bag or even a purse. It also comes in six different patterns. Take a look at how the Totseat Chair Harness works here. The Summer Infant Pop N’ Sit would be a great solution for a family that’s on the go. 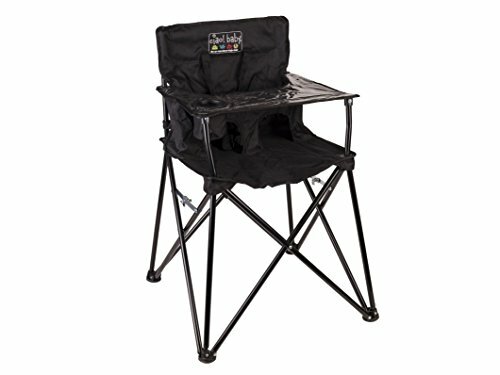 This seat is a “camping chair” style and folds up easily into the carrying case which has a strap for tossing over your shoulder. The BPA-free, dishwasher-safe tray detaches so that it could be pushed up to a table if necessary. It can be used on an adult chair or can be set anywhere that’s convenient, with adult supervision of course! The mesh pocket on the back of the chair would be a great place to stash some spoons, bibs, and wipes. It could even hold a book or two! Check out the Pop N’ Sit in action here. There are a lot of great options out there and a lot of great options on our list. Of the portable high chairs that we highlighted, the Graco Table2Table seems to the best job of meeting fulfilling the feature requirements that are important. It’s easy to clean with a chair pad that’s machine washable. 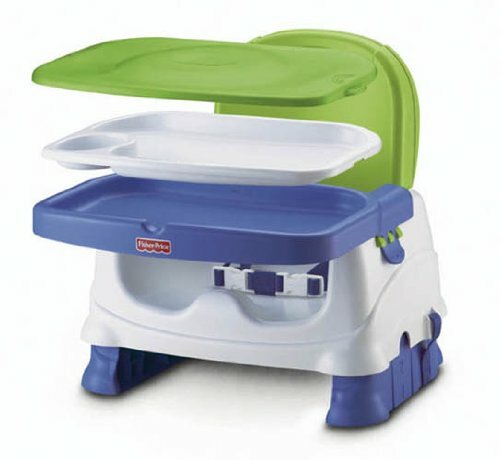 It does double-duty as a high chair and booster seat in one, meaning you don’t have to make a separate purchase. It folds up to travel and store easily and conveniently. It’s versatility really pushes it over the top. Thank you for visiting MyTinyTraveller.com. If our article has helped you make a decision about the best portable highchair for you, please click through to Amazon using one of our ‘Buy Now’ buttons. We are an Amazon Affiliate website and we keep our website running through the small commission we receive when you purchase your portable high chair from Amazon after visiting our site. There is no extra expense for you – the price is the same as if you went to Amazon directly. If you’re looking for more than the best portable highchair, please review our best stroller buyers guide.